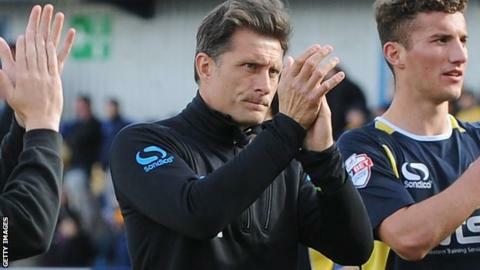 Torquay United manager Chris Hargreaves says the club will save £300,000 when the contracts of some of their biggest earners run out in the summer. The Gulls have already released and Niall Thompson and Elliot Benyon is out on loan. Benyon will be out of contract in the summer, as will Dale Tongue, Krystian Pearce, Aaron Downes and Ben Harding. "There are probably wages of £300,000 annually that are going to come off in the summer," Hargreaves told BBC Devon. The 42-year-old took over 12 months ago and inherited a number of players recruited by previous managers Alan Knill and Martin Ling. He could not save the club from relegation to the Conference, and believes he will not be able to rebuild the side properly until he is able to fill the squad with his own players. "I've got to build a team that can challenge and you're not going to do that on peanuts, historically the clubs that have gone up have spent big," Hargreaves said. "We did that when we went up, so will I have that type of money? I don't know, but I will be able to choose a squad of players, whatever budget it is, and then I'll be judged." Hargreaves has previously claimed there is at the club, and although Durrell Berry and James McQuilkin were signed on non-contract deals, he has struggled to persuade players to come to the club on loan. "I've spoken to four or five managers, three in the Premier League last week, and they've given me their blessing for players, but the players haven't wanted to come down to the area, they feel it's too far and that's another thing that's a stumbling block," he added. "I won't necessarily get any money, but if I can find a player that I can get in for nothing and we can sort out some sort of accommodation then of course we'd look at it."